Enjoy a magical Halloween or Theme Party appearance with a Fairy Teen Costume that is “out of this world”. As clichéd as it may sound, Teen Fairy Costumes really do have a special touch of magic and fantasy that puts a smile on any Girl’s face. Teen age years are full of wonders, which is what makes these Fairy Outfits for Adolescents fit so well fitting for this wondrous age group. The Fairy world is often visited by the imagination of Young Girls, who dream of a mystic utopia inhabited by well meaning Fairies. They offer to love and protect all the good things the world has to offer. Halloween is often associated with horrific Costumes that bring Fright, but Girl’s Teen Fairy Costumes counteract that tradition by bringing the light of peace and love to the darkest night of the year. 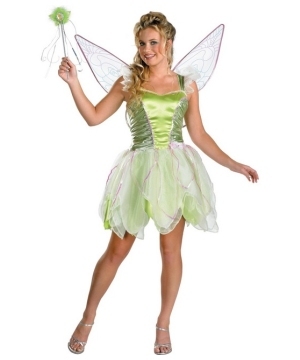 Embrace the good feelings that come from Fairy Teen Outfits and Dresses like the Tinkerbelle Teen Costume Deluxe. This fancy Fairy Costume for Teens invokes the fairest Fairy featured in the Disney Classic Peter Pan Movie. Tinkerbelle is a superstar among the Sprite world; everything from her beauty to her charming personality and good will to use her magic, makes her the Fairy that all the Pixies look up to. You too can embody everything that makes Tinkerbelle a Fairy role model. Similar Outfits like the Bluebelle Fairy Teen Costume, focus on the traditional view of the fairy world that is often portrayed in popular media. However, for those who seek an alternate take on the Fairy dream, there are Costumes that explore other realms. Try a Pumpkin Pixie Teen Costume. This experimental Teenaged Outfit Fairy takes element of Halloween and incorporates them in to the design. The Black and Orange Color scheme and the bat-like wings make this Ensemble a Halloween hit. Believe it or not, there is a dark side to the Fairy world. The Goth Fairy and the Graveyard Fairy and the TinkerHell Teen Costumes help you explore this often uncharted spooky side of the Pixie world. 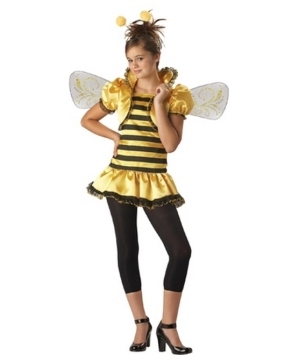 Regardless of you choice, Teen Fairy Costumes for Girls are the answer to the traditional Halloween monotony. They all come in Teen sizes ranging from 7-9, 10-12 and 12-14 so you will very likely find the perfect match for you.